New tools for improving pig health are being added to traditional management methods at a quickening pace. Orally active products like live vaccines to increase natural immunity, probiotic bacteria and prebiotic carbohydrates to outcompete gut pathogens, antibody proteins to bind disease antigens, and targeted nutrients to enhance early gut development seem to be introduced daily. The list and the benefits are diverse, but the one thing they have in common is that they work best when consumed early in life. What has not improved is the delivery mechanism for beneficial oral products. Until now, oral delivery meant catching pigs and force-feeding with some combination of syringes, pump bottles, and drench guns. Underline changes that; it is an oral delivery vehicle for nursing pigs that does away with dosing tools. 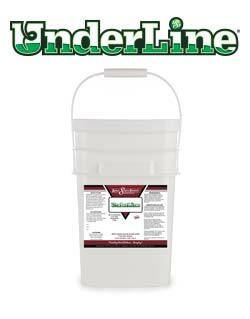 Underline is a powdered gel concentrate that managers mix with their own tap water, creating a protective gel that will mass apply any variety of orally active ingredients, even delicate vaccines and probiotics, for the litter to voluntarily consume. Gels made with Underline are easy to give to the pigs because the gel is sprayed on the sow’s udder using a hand held or backpack style pressure sprayer. Pigs nursing the sow are instinctively attracted to the gel and are driven to voraciously consume the active ingredients mixed in it. There are two key periods in the nursing pig’s life when veterinarians apply Underline with orally active additives, these are within the first week of the newborn’s life and about a week pre-weaning. Newborns. The pig’s first few days are key for the products that boost gut development. Underline is the most convenient way to dose colostrum-like antibody products, prebiotic carbohydrates, live probiotic bacteria, and nutrients that stimulate gut maturation. However, it is not the best time to deliver oral live vaccine because the sow’s maternal IgG antibodies passed to the pig in the first 18 hours via colostrum can interfere with the vaccine’s function, rendering it less protective. These maternal antibodies have a limited duration, and their rate of decay varies depending on the type of disease they are active against. Pre-weaning. To avoid this maternal antibody interference, veterinarians postpone live vaccinations. Several vaccine companies have adapted live vaccines to be conveniently given orally to pigs. Examples include Salmonella spp., E. coli, Erysipelas and Lawsonia (ileitis) vaccines. These vaccines can be added to drinking water for pigs, but nursing pigs do not often have an isolated water system in the farrowing house. This causes oral vaccinations to be delayed until after weaning. Delaying vaccine administration in this way presents two problems. First, disease challenges often appear immediately after weaning, implying that the pigs could benefit from the vaccine’s protection earlier, before being grouped together post-weaning. Second, to treat the disease that appears after weaning, managers may add antimicrobials in the water supply. These antimicrobials are lethal to live bacterial vaccines, putting managers behind the health curve. At a time when the vaccine could be given to build solid, natural immunity in the pigs, the vaccination is postponed or forfeited in favor of faster antibiotic treatments that are out of favor with regulators and consumers. Ahead of the curve. A better system is to get a head start, developing immunity from a vaccine by giving it to the pigs before they are weaned and grouped in different facilities, exposed to new challenges. Underline is the ideal solution. By simply mixing and spraying the oral vaccine in a gel made from the farm’s own tap water and Underline, managers can immunize the pigs before weaning without the chasing and catching or needles, syringes, and drench guns. Erysipelas vaccine is one of the bacterial antigens that have been adapted to dose orally. A major roadblock to building strong immunity with oral erysipelas vaccine is that the vaccine is fragile. 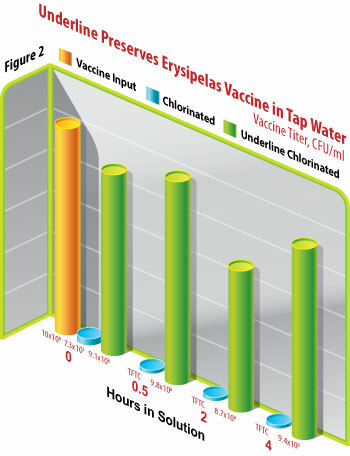 Erysipelas vaccine, even when it is diluted in seemingly harmless distilled water, can lose over 60% of its potency in less than 30 minutes, and 85% in fewer than 2 hours (figure 1). For a fragile erysipelas vaccine to be conveniently combined in a gel spray with tap water or well water, the gel must not only provide positional stability, meaning freedom from settling, it must also insulate the vaccine from threats like oxidation, variable pH, and electrolyte balance. Vaccine researchers at Gut Bugs, Inc. experimented to learn if Underline could preserve a live commercial erysipelas vaccine, rescuing it from inactivation by chlorinated water throughout the gel spray process. As an oxidizer that is commonly found in water systems, chlorine represents a more severe threat to vaccine. 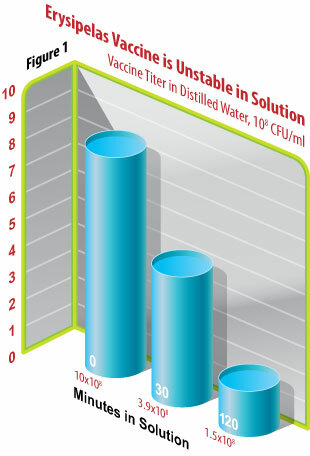 If Underline could reliably stabilize and protect sensitive erysipelas vaccine in tap water, it would allow veterinarians to confidently and conveniently spray it in the gel carrier to accelerate the onset of immunity. Vaccine titers were measured in triplicate upon input and after 30 minutes, 2 hours and 4 hours in suspension by plating samples to quantify the vaccine antigen CFU concentrations. Vaccine Titers. The baseline titer of the erysipelas vaccine input at time 0 was 10 x 108 CFU/ml (figure 2). Interestingly, the vaccine inactivation in non-stabilized chlorinated water was so immediate that even before plating at time 0, the vaccine lost virtually all measurable antigen, suffering more than a 5 log reduction. Subsequent concentrations in the chlorinated solution confirmed the vaccine CFU were too few to count (TFTC). In comparison, using Underline to stabilize the same water source in a gel suspension sustained the original vaccine potency throughout the entire 4 hours, with titers at 30 minutes, 2 and 4 hours measuring 9.8 x 108, 6.7 x 108 and 9.4 x 108 CFU/ml, respectively. Underline provides a novel delivery system that allows farmers to mass-apply orally-active supplements to baby pigs, in a form they will voluntarily consume as early as the first day of age. The dry powder mixes with ordinary farm tap water into a viscous, edible gel that piglets voraciously consume from the udder without the stress of catching, handling and individual dosing with syringes, pump bottles or drench guns. The gel is a delivery vehicle into which a wide variety of nutrients, vaccines, probiotics and functional food additives may be blended. The viscous gel and the orally-active supplement integrated with it are sprayed directly onto the underline of sows using an ordinary pressure sprayer. 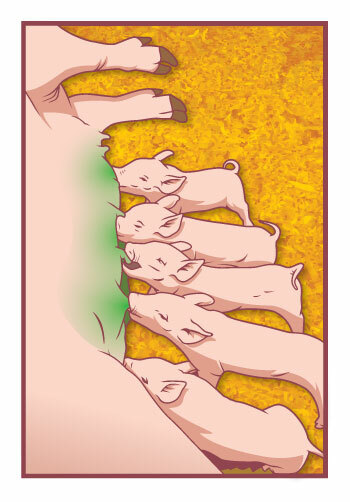 The gel adheres to the sow’s udder, remaining in position and available as the piglets voluntarily consume it. If desired, the concentration of gel powder may be varied to change the viscosity to carry a variety of active components. Producers have commonly used Underline to deliver live probiotic bacteria in the adhesive gel. Consequently, Underline also contains stabilizers to protect and preserve live biologicals from inactivation by oxidizers that may exist in the farm water supply. Additionally, the gel also manages pH and balances electrolytes to strengthen the stabilizing properties. This recent research confirms that Underline is capable of stabilizing a delicate live erysipelas vaccine, rescuing it from threats and making the gel even safer for the vaccine than distilled water. Improving the stability of the vaccine translates into greater immune protection for pigs, and delivering the vaccine before weaning can accelerate the onset of immunity. Building earlier immunity and safeguarding health before weaning opens up more flexible treatment options for managers and veterinarians when pigs are subsequently weaned and regrouped in different facilities.